The death toll from the Sunday terrorist attack on the Mar Girgis Cathedral in Tanta increased to 29 after two people injured in the bombing died on Monday, according to Mohamed Sharshar, the deputy head of the health ministry in Gharbiya governorate, state news agency MENA reported. 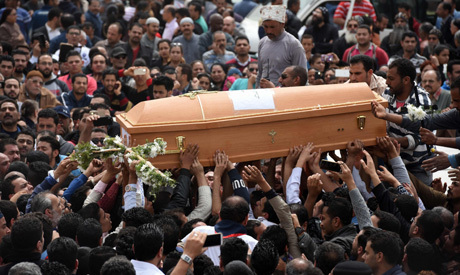 This raises the death toll from Sunday's twin terrorist attacks in Tanta and Alexandria to 46. Nagy Ramsis Girgis died on Monday morning in the ICU of wounds sustained in the suicide bombing of the Tanta cathedral, which injured over 70 people. His body has been handed over to his family. The 27 bodies of the victims who died in Tanta on Sunday were buried later that evening at the Mar Girgis Cathedral cemetery. Health ministry spokesperson Khaled Megahed said that most of the injured in Tanta have been released from hospital. Thirty people are still receiving treatment at Gharbiya hospitals, including 24 at Tanta University Hospital and six at the American Hospital. Ten of the injured were referred on Sunday to Nasser Institution and two to El-Mounira hospital in Cairo. Megahed added that most of those injured in the Alexandria cathedral bombing have also been released from hospital. Thirty-five are still receiving treatment at the governorate’s Alexandria University hospital, Mostafa Kamal Hospital and the Police Hospital. Hours after the Tanta attack, a suicide bomber detonated explosives outside St. Mark’s Cathedral in Alexandria, killing at least 17 people and injuring 40 others. The Islamic State militant group has claimed responsibility for the attacks.